The white crayon. It is brushed to the side, not used, left in the box, taken for granted. But that’s because it is misunderstood. Most crayon users are going to be children. They don’t know color theory. They don’t under stand shades and highlights. The white crayon doesn’t stand out like pink and green. If crayons were alive, had feelings, we could liken them to people. The big personality extroverts, those are bright colors. The ones that get worn down to nothing because they were so popular. Something like white, that doesn’t stand out. It sits in the box. Not too far off from how someone with a mental illness feels. They often feel left out, misunderstood, worthless. They want to be bright like pink and purple, but for some reason, the pigment, that extroversion, eludes them. But the white crayon isn’t worthless! It creates highlights, takes away shadows, creates different hues to EVERY color. It’s complimentary, it brightens up dark. It is an amazing crayon! Just as people with mental illness are! Sometimes it’s hard for people not living with a mental health problem to see. Just as a child with no art classes may not see the importance of white. 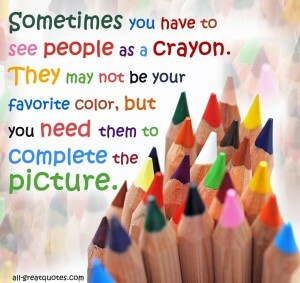 And those reasons, those misunderstandings are why The White Crayon Project was born. This is a personal project that my wife and I have started. For me, it’s the perspective of living with someone that suffers every day from a mental illness. I am no different than many. I don’t have these thoughts and feelings running through my head all the time. So, I try my best to listen and understand to the best of my ability. I couldn’t imagine my life without my white crayon. For my wife, it’s about passing along knowledge, knowing she’s not alone in her struggle and attempting to provide some insight in a world where there isn’t much available. She sees part of her healing journey in helping others. It’s starting out small, but we hope to see it grow and become a spark to understanding for many. It is about bringing awareness to mental health. In particular the struggle that is not necessarily visible to people. The fear, anger, embarrassment as well as an number of other feelings that people with different mental illnesses feel. To do that, we have started a support group on Facebook as well as a photography project. The photography project aims to take feelings, emotions, situations that people with different mental illnesses feel on a daily basis and TRY to bring that to light in a photograph. The idea is that a photograph is something visual. It is much easier for someone to understand than a feeling of anxiety where most people would brush a person off and say, “get over it” or “it’ll be ok.” We’re hoping to bring some emotion and just a taste of what some of these individuals feel. We hope it goes far. We hope it helps not only individuals who lack understanding of the day to day of someone living with a mental illness. But we hope it will help the people with mental illnesses as well. We want them to understand that they aren’t alone. We want the amazing people who share their story with us and are willing to get photographed to feel accomplished in this project. To maybe feel a little relief for being able to get part of their struggle out there. Stay tuned for some of the photo project to be coming soon! Hello! Where i can find photos from this project about The Whyte crayon? Hello Adina! Unfortunately the project was never really able to get off the ground. So as of now, it is still in limbo. But I leave the post up so that if I am able to come across people willing to model for me and have something specific that they would like to portray in a photo. Then I’m here to hopefully be able to help with that.